Since 1951 the B&K Precision name has represented quality, consistency, and value. We take pride in supplying outstanding products and excellent service at fair prices. Full certification by the International Organization for Standardization (ISO 9001:2015) reflects our commitment to excellence. Our mission is to maintain the standards that have built our reputation, develop new products to meet advancing needs, and continue providing the products and service our customers have come to trust. B&K Precision helped pioneer the electronic testing industry, and like so many early electronics firms, B&K started in a garage. By 1948, when Americans had begun buying televisions in large numbers, Chicago entrepreneur Carl Korn and his partner Philip Ban responded to the need for maintenance of often-unreliable sets. Frustrated by a lack of equipment to easily test television components, Ban and Korn began making their own devices and opened Central Television Service Company. They soon had a thriving business selling CRT rejuvenators and vacuum tube testers to other television service shops. By 1951, Korn had developed what would become B&K Precision into a company that had branched out into other areas of electronic testing and measurement. B&K engineers broke new ground, earning several patents in the field of television test equipment, and rapidly pushing the company to become a worldwide leader in electronic measurement. In 1961, Carl Korn placed B&K Precision under an umbrella corporation, Dynascan, comprising a variety of electronics firms. One of those companies, Cobra Electronics, came to dominate the Citizen's Band (CB) radio phenomenon. Choosing to focus on radios, Korn sold B&K Precision. Through an ensuing series of ownership transitions B&K continued to produce high-quality testing and measurement products. In 1996, engineer Victor Tolan, headed up a new ownership team for B&K Precision that launched a greatly expanded product line. The company also expanded upon its American base to better serve international customers. Company headquarters moved to southern California to provide improved service to Asia. In 2004 B&K expanded its presence in Europe through the acquisition of Sefram Instruments to better meet customer needs in the region. B&K Precision has come a long way from its days in Carl Korn's garage, but holds fast to the business ideals of innovation, flexibility, and solid customer service that have guided us from our humble beginnings in America, while reaching out to embrace the rapidly expanding global marketplace. We now provide service and support on four continents, and our design team draws upon resources in places as wide-ranging as Romania, Israel, and Taiwan. Our headquarters in Yorba Linda, California house most of our administrative and executive functions including research and design, customer service and repair, and sales and marketing. The California warehouse ships to North, Central, and South America, and our service center provides our customers with live, one-on-one support. Our European customers have become most familiar with B&K through our Sefram subsidiary. Sefram's offices in St. Etienne, France currently support customers in Europe, the Middle East, and Africa. Engineers in Asia know us through our ITECH, Lodestar and now our B+K Precision Taiwan brands. Offices in Nanjing and Taipei provide distribution and service throughout Asia, as well as the Middle East and Africa. 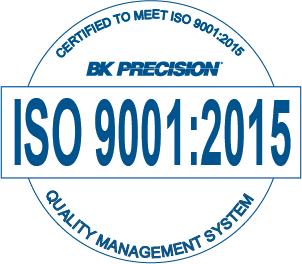 At B&K Precision, we're committed to providing excellent product support and customer service to both current and future users of our products, and strive to continuously improve our operations. We're regularly upgrading our existing capabilities and services, and adding new methods of support to meet the changing needs of our valued customers. To help our customers determine quickly and efficiently which instruments best fit their application and budget, we provide comprehensive and growing resources on our website such as: datasheets, user manuals, high resolution product images, selection guides and tools, software, videos, application notes, product guides, and "where to buy" information. If you cant find the information you are looking for using our website, you can call us and talk to an experienced engineer with in-depth knowledge of our products who will be able to discuss your application and requirements. If you need help with an instrument youve already purchased, we are here to assist you with product setup, usage or troubleshooting. You can find additional support by browsing our knowledge base or you can contact us directly via email or phone, which are answered in a timely manner by a qualified engineer. Every new B&K Precision instrument comes standard with a 1, 2, or 3-year warranty against defects from the original date of purchase. Our warranties are valid worldwide, and we provide service and support through our global network of partner companies and dedicated service centers to guarantee your satisfaction. View this page for the range of available calibration and repair options. We make every attempt to support our customers even long after a product has been discontinued. Our goal is to service and repair B&K products up to 7 years after their obsolescence date, provided spare parts are still available. In many cases, we provide user manuals, calibration procedures, spare parts and schematics for selected discontinued products well beyond the 7-year period.